All Star Flags is pleased to offer our new Armed Forces Flag. This new flag features the official seals for the U.S. Army, U.S. Navy, U.S. Air Force, U.S. Coast Guard and U.S. Marine Corps. 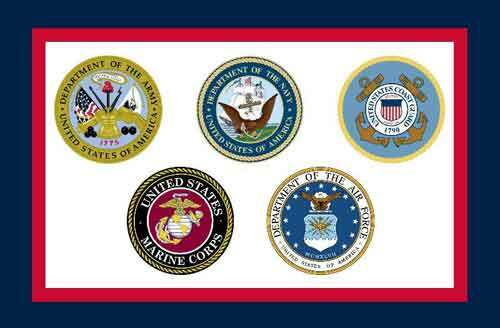 All five branches are represented on one flag to help show your support for all our service men and women. The Armed Forces Flags are made of 200 denier nylon and feature canvas header with brass grommets. The flags are finished with four rows of lock-stitching on the fly end for added durability. We have the new Armed Forces Flag available in three sizes: 2×3’, 3×5’ and 4×6’. The Armed Forces flag is available for immediate shipment in time for Veterans Day. American Flags and Kentucky Flags to fly at half-staff Tuesday, October 30th in the Commonwealth of Kentucky in honor of US Army Pfc. Shane G. Wilson. US Army Pfc. Shane G. Wilson died Oct. 18, in Khost, Afghanistan while supporting Operation Enduring Freedom. Wilson was assigned to 3rd Battalion, 187th Infantry Regiment, 3rd Brigade Combat Team, 101st Airborne Division (Air Assault), Fort Campbell, Ky.
American Flags and Virginia Flags to fly at half-staff Saturday, October 27th at the Capitol complex in Virginia in honor of US Army Sergeant Robert J. Billings. Flags are also authorized for display at half-staff in the County of Halifax, the County of Mecklenburg and the Town of Clarksville and in any other locality as deemed appropriate. American Flags and New Hampshire Flags to fly at half-staff Tuesday, October 23rd in New Hampshire in honor of US Army Sgt. 1st Class Ryan Savard. Savard died Oct. 13 in Khanabad District, Afghanistan from small arms fire while on patrol during combat operations. SFC Savard was assigned to Headquarters and Headquarters Company, U.S. Army Special Operations Command at Fort Bragg. American Flags and Arizona Flags to fly at half-staff Tuesday, October 23rd in the state of Arizona in honor of US Army Sgt. 1st Class Ryan Savard. Sgt. 1st Class Savard died Oct. 13, in Khanabad District, Afghanistan, from small arms fire while on patrol during combat operations. He was assigned to Headquarters and Headquarters Company, U.S. Army Special Operations Command, Fort Bragg, N.C.
North Carolina Flags to fly at half-staff Monday, October 22nd through Tuesday, October 23rd in honor of NC State Senator Don East. Don East of Surry County, passed this morning following complications from surgery. He represented his District 30 for seven terms in the N.C. Senate. East was a retired police officer who represented the citizens of Alleghany, Stokes, Surry and Yadkin counties. American Flags and South Dakota Flags to fly at half-staff Monday, October 22nd through Friday, October 26th in South Dakota in honor of former US Senator George McGovern. McGovern also was the Democratic nominee for President in the 1972 election but lost to Richard Nixon. He was known for his opposition to the Vietnam War and later spent his time and energy working towards feeding needy children around the world. Maryland flags to fly at half-staff Sunday, October 21st in Maryland in honor of former State Senator Clarence Mitchell III. Mitchell served in the House of Delegates from 1963-1967 and in the Maryland Senate from 1967-1986. American Flags and Iowa Flags to fly at half-staff Friday, October 19th in the state of Iowa in honor of State Senator Pat Ward. American Flags and Colorado Flags to fly at half-staff Tuesday, October 23rd in the state of Colorado in honor of Veronica Moser-Sullivan. Moser-Sullivan, 6, was killed July 20 in the Aurora movie theater. A private funeral Mass will be held Tuesday, Oct. 23, in Denver.